I live in Driffield, East Yorkshire, UK, close to the famous Driffield Beck chalk stream.I started fly fishing at the age of 14 but in my early 20s I was seduced by mountaineering and at the age of 40 mountain biking. As a result I had over 20 years without fly-fishing! Then in 1998 I damaged my back in a mountain bike accident and returned to my old love of fly-fishing. I was once again hooked! My passion is for river fly-fishing, particularly dry fly, using imitative patterns (I often fish with CdC flies as small as size 30). Grayling are my favourite fish. I am obsessed by the search for perfect presentation of the fly, which is why I am an avid Tenkara addict. Presentation is the reason that in 2012 I became fascinated by the Italian Style of casting. I am also passionate about protecting our rivers and am a member of the Wild Trout Trust, Grayling Society, Yorkshire Wild Life Trust and am a trustee of the East Yorkshire Rivers Trust and local coordinator for the River Flies Monitoring Initiative for which trained angler-entomologists sample their home rivers every month to check the health of the water. In addition I am vice chairman of the Pickering Fishery Association (fishing club) and chairman of the East Yorkshire Fly Dressers club. 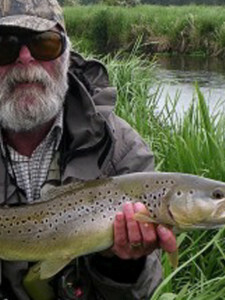 I also regularly write articles for Fly Fishing and Fly Tying Magazine and the Grayling Society Magazine. I have fished all over the world; Austria, Slovenia, Belgium, Sweden, Poland, New Zealand, USA and Canada. I am proud and very honored to have become an Italian casting style Instructor.